Here's why this week’s final poolside party with Garage Nation at Ibiza Rocks is a must. Holler with the rinsin' sound! 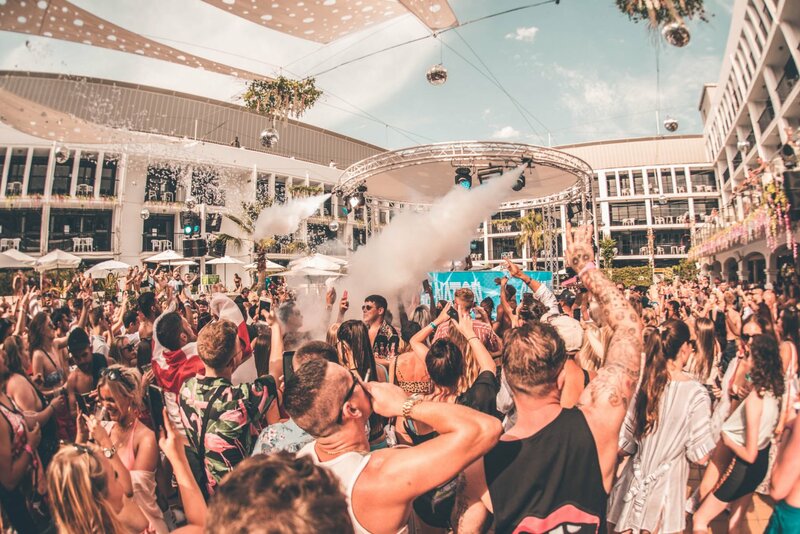 Legendary club night Garage Nation has smashed three-quarters of their four-date residency at the infamous Ibiza Rocks Hotel this summer. After this past week, one more date remains on Thursday 13 September. Based on this season, UKG is no doubt back in the ascendant. After two hugely successful garage get downs back in June, it was no surprise to see the same excitement for the last two dates this September. Last Thursday saw original pioneers Oxide & Neutrino back on the decks. A guilty pleasure of mine, I was excited to dance to throwback anthems in the sun-soaked surroundings of Ibiza Rocks Hotel - a cheeky little getaway from hard, pounding rave music. Garage music is definitely one of the rare British gems, like Yorkshire pudding. Bubbly as champagne and sweet as a young crush, UK garage has rewired pop and dance music in the late '90s. It is super fun, catchy and nostalgic, reminding you of that boozy holiday or wild house party back in the day. We grooved our way around the pool and on to the dance floor to signature garage tunes such as Sorry (I Didn't Know) by Monsta Boy. The feel-good vibes and uplifting energy exceeded all expectations. Every old-school soundtrack had everybody singing and nobody was shying away - perhaps at least in part because the rum and coke was flowing. Surrounded by beaming smiles, the memorable lyrics and funky beats brought everyone together. Skanking with new found friends is what Ibiza is all about. After all, we are all here for the same reason: the music. A little bit of Sweet Female Attitude connects any dance floor. Not just a nostalgic re-rewind as DJ Cartier and Pied Piper joined the line up along with new school modern heroine Flava D. She turned things up a notch dropping fierce bassline bangers and bringing a new fresh flava of funky house and two-step back to the rave. “When I say Majestic, you say OI” - completing the line-up MC DT. He kept the energy pumping with Majestic, providing fierce grooves and roof-raising tunes such as So Solid Crew's smash hit 21 seconds. If you are not spitting bars along with this track, then you're getting pushed straight in the pool. Romeo done! Celebrating over two decades of the UK garage scene, the finale on Thursday is set to take this Ibiza Rocks pool party to the next level. Original garage champions DJ Luck and MC Neat will headline for a very special performance along with TQD member and bassline king DJ Q, and more of the best DJs and MCs in the industry: Norris Da Boss, Sam Supplier and MC PSG. It's going to be sweet like chocolate. The fourth and final party approaching on Thursday is set to be a slam dunk for the pool party as 2018 has seen some of the world's biggest promoters of UK garage tear up the dance floor. If you're looking for pure energy, then, original UKG ravers, garage lovers and company, this is the event for you. Are you in? See below for full info and tickets.